Many countries are facing severe ethnic disparities in education, as the academic achievement of ethnic minority pupils lags behind that of their majority peers. With migration on the rise, this achievement gap has far-reaching consequences not only for the future life chances of individual children, but also for our societies at large. Many scholars and policymakers have argued that linguistic differences play an important role in this regard. Indeed, many studies have found an achievement gap between migrant children who speak the language of instruction at home and those who do not, even when their socioeconomic backgrounds are taken into account. Policymakers have responded to these studies by exerting pressure on schools and minorities to increase the use of the instruction language, which has resulted in efforts to actively discourage the use of the mother tongue or the heritage language in schools and at home. A study that my colleagues and I conducted in Belgium-Flanders shows that 77 percent of teachers believe that language minority children should not be allowed to speak their mother tongue at school, and almost a third think that they should be punished for doing so. What’s more, only about thirteen percent of teachers think that the school library should offer books in the various home languages of the school’s pupils. Qualitative studies in other countries, too, such as Germany, France, the United States and the Netherlands, have found that minority pupils’ mother tongues are excluded from schools. While this push towards monolingualism is mostly driven by worthy motives, namely a desire to stimulate intergroup contact and prevent students from becoming underachievers, restricting pupils’ use of their mother tongue can have detrimental effects. Indeed, many scholars point to the significance of the heritage language for children’s well-being, identity development, and academic success. There is abundant evidence that exposure to both the heritage language and the language of instruction is important for academic achievement. A study that my colleagues and I conducted using the international PISA 2012 data shows that within the group of minority children, more frequent use of the heritage language at home is associated with higher performance in math and language. On the other hand, the same study reveals a significant correlation between more frequent exposure to the instruction language with peers at school and higher math and language achievement. In other words, the context of language exposure is of critical importance. More importantly, the specific activities children are engaged in as they use these languages are more significant than the frequency of use or exposure in general. This is evident from the graph shown below, which is based on the PISA 2012 data from Flanders and compares the math achievement of language-minority pupils with their reading activities, whether during leisure time or at school. The first group of pupils, who do not read books, magazines or newspapers at all, perform much worse than average. 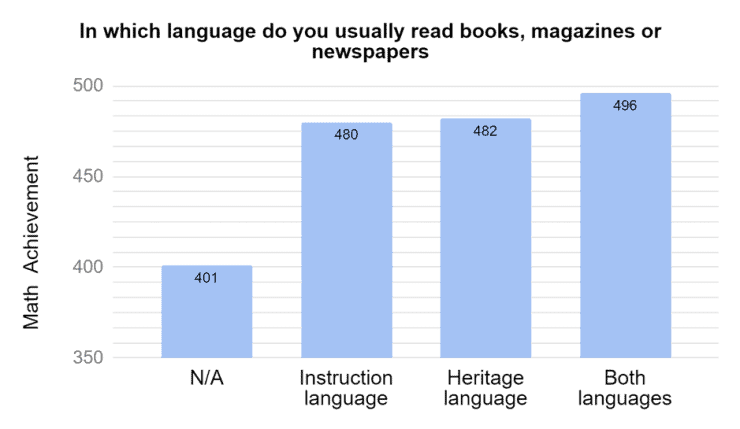 The second group of pupils, who read in the language of instruction, and the third group, who read in their heritage language, perform similarly well. The fourth group, made up of pupils who read in both languages, outperforms all of the other groups. However, when we conduct a similar analysis of TV-watching behavior, we find very little positive effect on academic performance of watching TV in either the heritage language or the language of instruction. These findings have important implications for education and teaching. Exposure to both the heritage language and the language of instruction may well improve the school performances of minority pupils. It should be noted, however, that the quality of exposure is more important than the language that is used. High-quality educational activities, such as reading books, should happen in both languages. The literacy resources that are available at school should therefore be multilingual and should include books and other resources in the children’s heritage languages. Pupils should be encouraged to look up information in their mother tongue and compare it with information in the instruction language – using Wikipedia, for example. For younger children, reading aloud is found to predict future academic achievement. They should therefore be encouraged to read aloud in different languages, both in ECEC settings and at home. Yet an appreciation of the benefits of multilingualism for learning should not be confused with a laissez-faire language policy. It is also important for language-minority pupils to have conversations with their peers in the language of instruction. Accordingly, it is not a good idea to pull pupils out of mainstream classes and segregate them in language-learning classes, where there is little opportunity for meaningful interaction with proficient speakers.